Thank you for providing such a wonderful experience. I was on the 2 day tour Death March Tour in late June and felt completely cared for. My guide Caterine was knowledgeable and personable. She cared for me every step of the way. I learned so much about the history of the prisoners. I appreciated how she wove in details as we went along, answering questions when I had them and also she had consistently high energy. 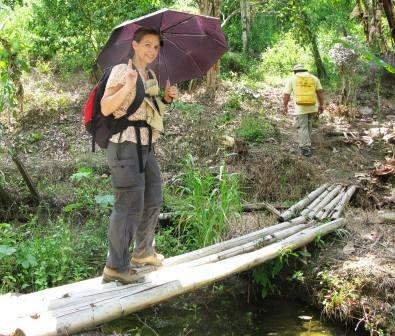 Having a local trekking guide, was a wonderful experience too. Malidin knew the area so well. I only hope to return and take a jungle survival class from him! Together he and Catherine taught me about the plant life in the area, and described key features of the terrain. The driving by Jeffry was safe and professional too. Your entire operation far exceeded my expectations and I will highly recommend your tours to people I know. Although the prisoners were not American like I am, the whole Allied force was one and I felt such kindred spirits with the families who lost loved ones in Borneo. My heart goes out to them. Again, I appreciate the professionalism and high quality of all you provide.